Downtown Lafayette’s Long Center for the Performing Arts, housed in the historic Mars Theater, features various local and traveling acts year-round. Groups like the Lafayette Ballet Company, the Lafayette Symphony Orchestra, and Bach Chorale Singers regularly appear at the Long Center. Touring acts like comedians Heywood Banks and Brian Regan have also played there. 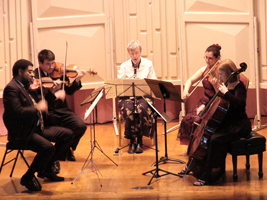 The Tippecanoe Chamber Music Society presents six concerts each season, mostly in historic Duncan Hall in downtown Lafayette. The Society’s educational mission includes annual performances in local elementary schools that enhance the musical education of children. You can see the TCMS upcoming concert schedule and get more information about the group and their activities on their website. Purdue University is a rich source of culture and arts for Greater Lafayette. Purdue Convocations regularly features concerts, plays, and activities around campus, and brings major acts like Lord of the Dance and comedian Lewis Black to the Elliot Hall of Music. The Purdue Musical Organizations (PMO) has been serving the Purdue University family as ambassadors of goodwill on campus, across the country, and around the world for more than 70 years. The hugely popular Purdue Christmas Show is presented annually to a live crowd of thousands and reaches millions more through international broadcasts on public television and radio networks. The PMO is made up of a number of performing groups, including the Purdue Varsity Glee Club, Purduettes, Purdue Bells, Heart & Soul, All Campus & Community Chorale, and “PMO Specialties” like Ba-Na-Na, Holy Cow Girls, and Four-In-Hand. The student performers in these groups present more than 200 performances each year, and surprisingly, not a single performer is a music major — because Purdue does not even offer music as a degree objective. Whether it’s visiting a museum, attending a performance, or joining an arts organization, Lafayette provides many opportunities to get involved with the arts. For information, please contact the Tippecanoe Arts Federation at the Wells Community Cultural Center.